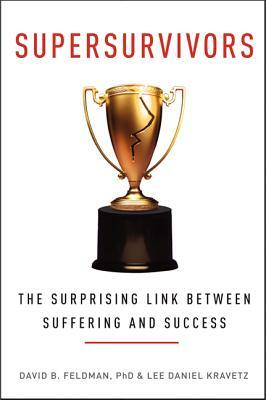 Starting where resiliency studies leave off, two psychologists explore the science of remarkable accomplishment in the wake of trauma, revealing the surprising principles that allow people to transform their lives and achieve extraordinary things. Over four billion people worldwide will survive a trauma during their lives. Some will experience severe post-traumatic stress. Most will eventually recover and return to life as normal. But sometimes, survivors do more than bounce back. Sometimes they bounce forward. These are the Supersurvivors—individuals who not only rebuild their lives, but also thrive and grow in ways never previously imagined. Beginning where resilience ends, David B. Feldman and Lee Daniel Kravetz look beyond the tenets of traditional psychology for a deeper understanding of the strength of the human spirit. What they have found flies in the face of conventional wisdom—that positive thinking may hinder more than help; that perceived support can be just as good as the real thing; and that realistic expectations may be a key to great success. They introduce the humble but powerful notion of grounded hope as the foundation for overcoming trauma. The authors interviewed dozens of men and women whose stories serve as the counterpoint to the latest scientific research. Feldman and Kravetz then brilliantly weave these extraordinary narratives with new science, creating an emotionally compelling and thought-provoking look at what is possible in the face of human tragedy. Supersurvivors will reset our thinking about how we deal with challenges, no matter how big or small. David B. Feldman, PhD, is among the top experts on hope in the field of psychology. An associate professor of counseling psychology at Santa Clara University, he has written for Psychology Today and the Huffington Post, published research in top scientific journals, and lectured around the world. He lives in the San Francisco Bay Area. Lee Daniel Kravetz has a master's degree in counseling psychology and is a graduate of the University of Missouri–Columbia School of Journalism. He has written for Psychology Today, the Huffington Post, and the New York Times, among other publications. He lives in the San Francisco Bay Area with his wife and children.